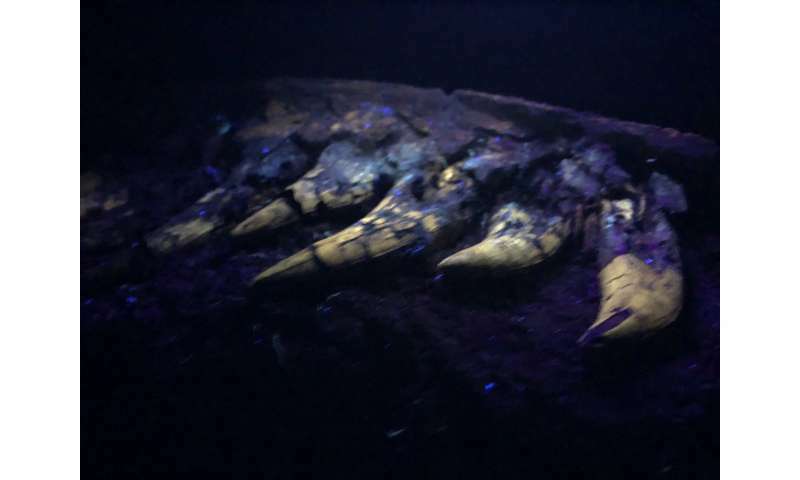 For now, there are just a few things researchers and students at the University of Kansas want people to dig about the new dinosaur they recently excavated in Montana's Hell Creek Formation. First off, it's a "fabulous" complete section of the upper jaw with all of its teeth intact, along with bits of the specimen's skull, foot, hips and backbones. It's likely to be the rare fossilized remains of a young Tyrannosaurus rex that lived 66.5 million years ago. But it also could be another species of smaller meat-eating dinosaur (it's a bit of a scientific controversy)—they're still analyzing their discovery. KU's new specimen has the information that may provide the deciding factor of which theory is correct. "The teeth suggest it's a Tyrannosaurus rex; however, there is still more work to be done," said David Burnham, preparator of vertebrate paleontology at the KU Biodiversity Institute. "Because a young T. rex is so rare, there are only a few that have been found over the years, so it's difficult to discern what are changes due to growth or if the differences in the bones reflect different species. Fortunately, KU has an older T. rex to compare with and another young T. rex on loan to help decipher this problem." "Confusing the issue here is age," Burnham said. "Ontogeny, that's the process of growth—and during that process we change. Adult dinosaur bones, especially in the skull, don't look the same as their younger selves. So, if someone finds a baby or juvenile fossil they may think it's a new species, but we have to be careful since it may represent a younger growth stage of an existing species. It's reasonable to assume Nanotyrannus could be valid—but we must show it's not just a stage in the life history of T. rex." "We're going to go back out this summer—we're going right to that spot," said the KU researcher. "We think and hope there's more there." In the meantime, Burnham and his fellow researchers (including Kyle Atkins-Weltman, graduate student and assistant fossil preparator) are working on a paper that will address the question of their fossil's place in the family tree of theropod dinosaurs. "With the specimens here at KU, we'll be able to address the issue and make a declarative statement about Nanotyrannus," Burnham said.